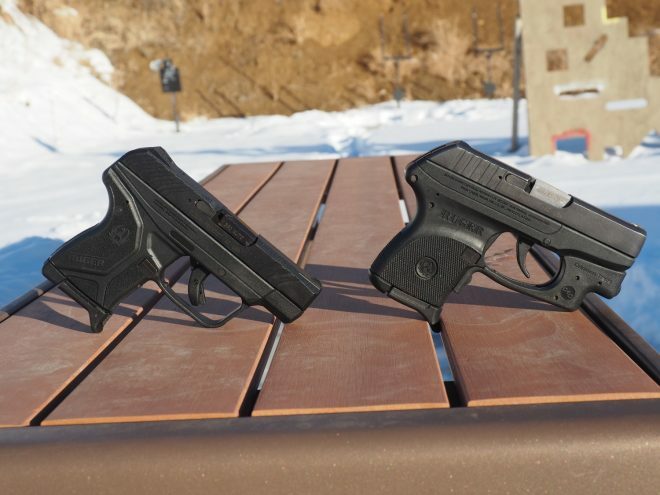 Ruger LCP II Review | Action Firearms and Accessories, Inc. I remember the first time I saw a Ruger LCP in person. It was at Gunsite’s pro shop in the spring of 2008. Better built than the P-3AT, it won me over and became part of my regular hot weather carry rotation. I have fired a heck of a lot of rounds out of that Ruger (approximately 3k) and it still works well. Though it’s been a great little pistol for pocket or holstered carry while in running or workout clothes, I always thought there were two areas for improvement: The trigger and the sights. Ruger was not content to rest on their laurels with the success of the LCP and has continued to improve the pistol. 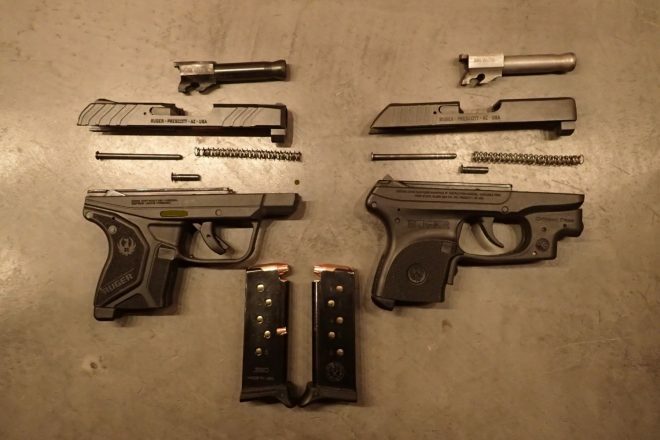 Though they first modified the main shortcomings with the LCP “pro” edition in 2015, a year later Ruger completely updated those exact two areas with the LCP II. I got a chance to handle and shoot some LCP II models at various industry events. The main difference is that it features Ruger’s SAO trigger. This trigger only has to release the pre-cocked hammer. Therefore, it features a far crisper break, shorter pull, and shorter reset compared to the LCP. The sights are a bit more substantial as well, and the rear of the grip is both slightly wider and features a better texture than the LCP. Also of importance is the redesign of the LCP II magazine, namely the follower. The new magazine locks the slide back when empty. This is always a nice advantage to have for the purposes of reloading with alacrity. Liking the LCP very much, but I did want the improvements of the LCP II. I decided to acquire one when I had saved up enough. 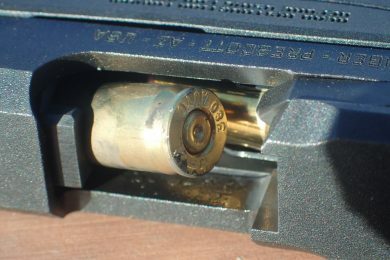 Fortunately, it didn’t take long, as the LCP II costs less than most cases of rifle ammunition. 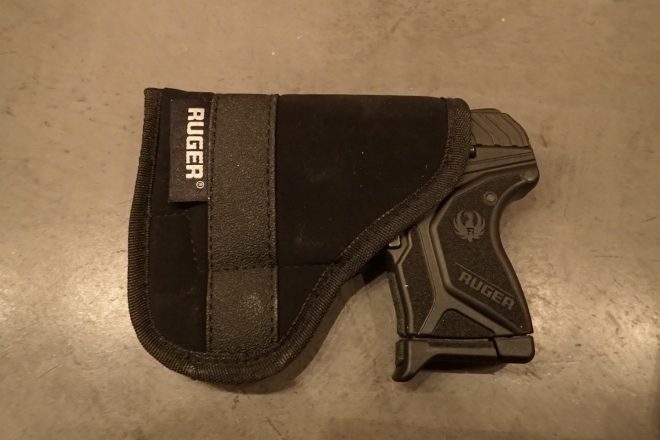 The first thing I noticed when opening up the cardboard box the LCP II ships in was not the firearm itself, but the holster-a very nice touch by Ruger. 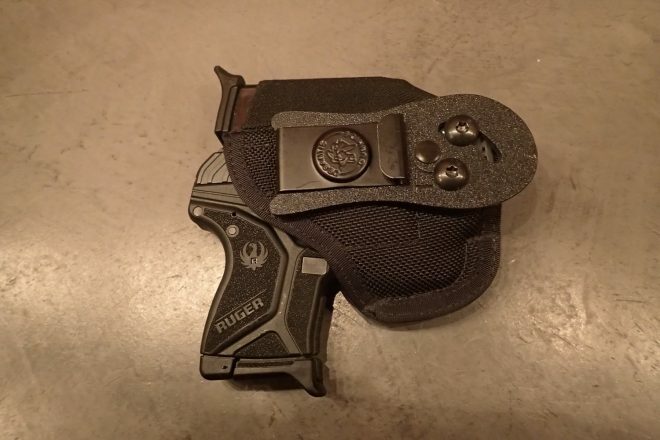 Recognizing the pistol’s most likely method of carry, Ruger includes a nice and well-textured pocket holster with each pistol. These do not have the outer flap of the DeSantis Super Fly that makes the gun print like a wallet, but they are perfectly functional pocket holstersright out of the box. Fit and finish were very good, as it was with the original LCP. The slide is easy to rack, and the one provided magazine seated and ejected positively. The magazine release is small, but not so small that one has to fiddle around or exert a lot of pressure to get it to work. 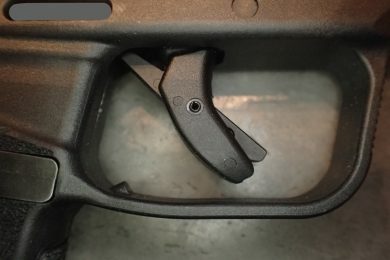 The “SAO” trigger was far better than the old LCP trigger. I dry-fired both the LCP and the LCP II side by side and it is abundantly clear that the LCP II wins in this category. Grip length remains about the same-I could get about one and a half of my sausage fingers on the grip without the flush fit magazine, and two with. 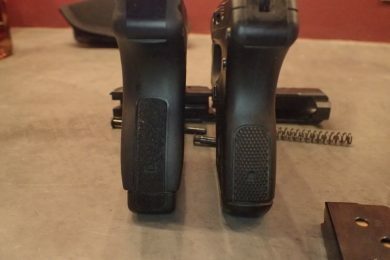 The slightly wider grip (.898″ vs .775″ for the LCP)and slightly more aggressive texture on the sides and backstrap didn’t seem like a huge deal when holding them side by side. It was only at the range where the keys to this difference became apparent. Grabbing an ammo can full of .380 ammo and my old LCP for comparison’s sake, I headed to the range with the LCP II. Right out of the truck, I drew the LCP II and fired 3 full magazines of .380 on an IPSC sized steel silhouette at 25 yards. Though this pistol is small, it was easy to fire. Every round of that initial string impacted the target. The sights, though just a bit bigger than those on the LCP, definitely aided in acquiring and re-acquiring a sight picture faster. The redesigned trigger was the big factor in getting all 19 rounds on target. For comparison’s sake, I fired the LCP II alongside an LCP and a “Walther” (S&W-era) PPK. The LCP II blew both away in comfort, trigger feel and accuracy. That it performs so much better than a much larger and heavier pistol like the PPK is a testament to its excellent design. Moving on to a more formal range setting, I tested the LCP II with 5 different .380 loads for reliability. Around 40 rounds into the test, I experienced both an FTC and then an FTE a few rounds apart. I discovered this was due to the cloth on the finger of my light glove getting caught on a shelf of the triggerabove the trigger bow. 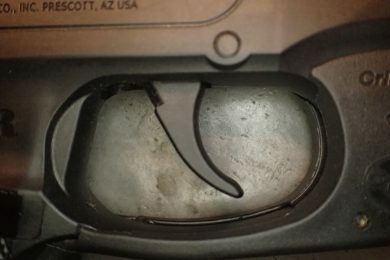 When caught like this, the trigger would not fully reset and was the cause of both malfunctions. After becoming aware of this, I tried the pistol both ungloved and then with having modified the position of my gloved finger on the trigger. No more such malfunctions occurred. Malfunction which occurred when the fabric of my glove got caught in the trigger shelf. 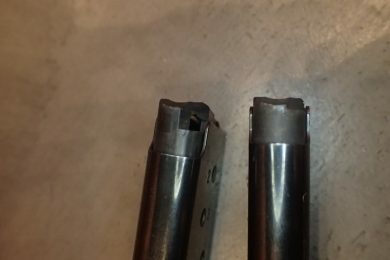 One very positive result I achieved from testing the LCP II with Grizzly 70gr +P+ HP ammo was that the new LCP II magazines feed these longer rounds reliably, while the old LCP magazines would not. The new LCP II magazines are better in every way, from smoother feeding and a more precise fit of the follower to being able to lock the slide back on empty. As far as firepower is concerned, I was impressed with the performance of the Grizzly +P+ ammunition, which achieved 1185 fps at the muzzle out of the 2.75″ barrel! 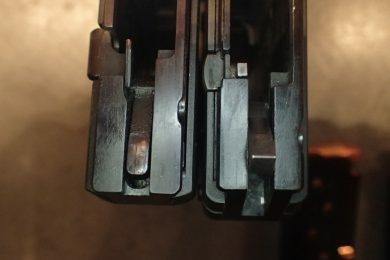 One more note on magazines: Original 6 round LCP magazines will function just fine in the LCP II, but not the 7 round extended mags for the old LCP. I tested the LCP II for accuracy by firing offhand at 5 and 10 yards. All results are 6 shot groups (a full magazine) measured edge to edge with the subtraction of bullet diameter. Accuracy was impressive for such a little gun. It seemed to prefer the lighter JHP bullets to the FMJs, which is a good thing for a self-defense pistol. The only ammunition that did not perform very well was Magtech. 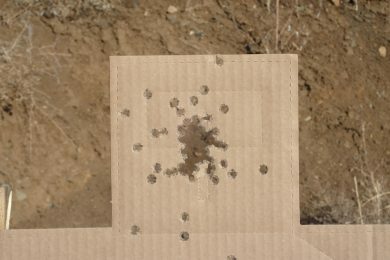 After the precision shooting, I fired full magazines as fast as I could at the headbox of an IPSC target at 3, 5, 10, 15, and 20 yards for a total of 50 rounds. Only one round was a “miss”. 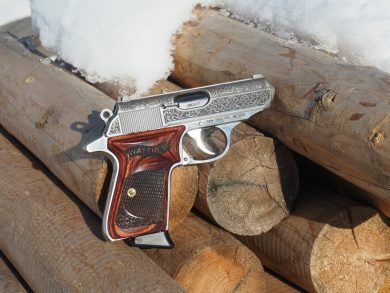 This pocket pistol is very easy to employ with a great degree of practical accuracy. Moving on to steel target arrays, I proceed to increase the total rounds fired to 750 rounds of both JHP and HP through the LCP II in order to establish if it was reliable enough for EDC. 500 rounds should be a minimum assessment period for something you would stake your life on, but 750 or 1000 is even better. I fired the LCP II one handed, weak hand, upside down, sideways, from retention, and even purposefully tried to induce a “limp wrist” malfunction. This pistol took it all and did not fail in any way. The magazines also dropped free each and every time I hit the mag release, and never when I didn’t want them to. Not only did I come away assured of the LCP II’s reliability, but also impressed at the redesign and improved ergonomics. I’m sure my trigger finger would have pained me after firing so many rounds in such a short period from the old LCP, due to its less than ideal trigger pull and reset. Not so with the LCP II. Furthermore, the improved grip ergonomics left me with no pain in the web of my hands. Take this with a grain of salt, however, as I used to regularly practice with and carry a 340PD. Objectively, the LCP II is a micro-compact .380 that paved reasonably accurate and very reliable with many different loads. It has a much lighter and shorter trigger pull and shorter reset than the old LCP, as well as the upgrade of the magazines locking the slide back on empty. Though it only ships with one magazine, the inclusion of a pocket holster is a very useful extra for consumers. Subjectively, I found the LCP II to be very easy to draw, point and shoot. The slightly larger sights work well for me, though if one has the funds one can put on night sights. A small laser also would be a good add-on, and there is a factory model fitted with a Viridian laser if you can find one. Of the five .380 pistolsthat I have extensively shot, the LCP stands head and shoulders above them all. Ruger has fit a lot of quality in a small and inexpensive package. If you are in the market for a backup piece, deep concealment pistol, or a gun that you can carry easily while wearing PT shorts, give the LCP II a try!